Am I the only one feeling that the must be better ways to share research insights than just sitting down passively, and listening to a long list of key note speakers at a conference? Just what I thought. The Stockholm Resilience Centre now launches a web-log as part of a newly started collaboration with the Earth System Governance community and conference participants of the 2009 Amsterdam conference. 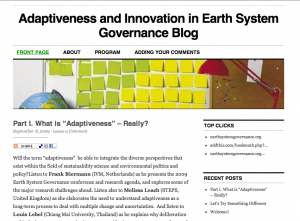 The blog – which will be updated regularly until December – includes interviews with prominent scholars in the field of earth system science and governance. They will all elaborate different aspects of adaptiveness and innovation in an era of global environmental change. See it as a way to tap into the collective intelligence of different global change research communities. The first topic is: “What is “Adaptiveness” – Really?” Listen to interviews with Frank Biermann (IVM, Netherlands), Louis Lebel (USER, Thailand) and Melissa Leach (STEPS, United Kingdom) as they explore this important concept with strong connections to resilience theory. I’m really glad to see that people are thinking about new ways to tap into collective intelligence. I do hope, however, that the collective will not be limited to the intelligence of the experts and specialists. In these critical times we must find new ways to include also the collective intelligence of the larger social order. This is why I would like to connect you with a very innovative approach to governance and policy formulation that is emerging in Brazil. It’s called, Digital Participatory Culture. Thanks Lou, you make a very important point. I will def have a look at the link, and try to do and post an interview with the initiative you mention. Thanks!